Casino Slots Capital is known and loved by veteran players as the old Slot'o'Cash Rival Casino and remains a reliable favorite for players from the US and various other jurisdictions around the world. The casino has managed to create highly effective add-ons that all players can take advantage of, including their promotions. In addition to the daily and once a week bonuses, Slots Capital offers an abundance of daily offers starting with a 300% Monday bonus by using code MONDAY300, Tuesday enjoys a 200% bonus using bonus code TUESDAY200 and using Bonus code WEDNESDAY99 will enable a bonus of $49 on $50 deposits. The weekend starts early at SlotsCapital Casino and on Thursday when using 150WEEKEND- it will add a 150% bonus to your deposit and Friday's offer up a treat with another bonus of 100% plus a $100 free chip on Saturday- use bonus code 100FRIDAY100. On the weekend up to $1000 may be claimed when you deposit and use code SATURDAY250 and Sunday's, a day of rest, enjoys a 100% bonus as well with code EASYSUNDAY. While Slotscapital Casino restricts a number of countries such as Canada, the United Kingdom, Netherlands and the U.S Virgin Islands, it remains a popular choice for players located in the United States as well as Belarus, India, Germany, Slovenia and South Africa. They include a broad range of currencies to ensure they are in a position to accommodate player preferences as well as dedicated support. Rival Gaming boasts an abundance of 3 reel as well as 5 reel slots, its mobile suite is continually expanding, and players love its table gaming variety. Rival currently offers a library of 205 games, all popular due to incredible animations, graphics, and the variety of bet sizes to select from. Mobile games perfectly integrate with all Android and iOS handheld devices and games adjust flawlessly to all screen sizes. The biggest Rival Gaming Jackpot occurred on the 25th of February 2013 when one player triggered the Money Magic jackpot and won $299,673. The same game also awarded a win of $272,931 a year earlier in February 2012. Among the impressive selection of video slots they feature, there have been a few that stand out as favorites at Slots Capital Casino. These include both classic and full featured 5 reel slots, giving all the opportunity to take advantage of the uniqueness of each. The most popular titles currently are As the Reels Turn, Mystic Wolf, Spy Game, Loco 7's, Rock On, Diamond Cherries, and many others. The casino also features the full range of table games from Rival. This will provide you the ability to enjoy Blackjack, Poker, Baccarat, Craps, Roulette, and others at the casino. Each of the table games feature additional betting options with a professional interface. Casino Slots Capital might have limited themselves in regards to jackpot games by offering only Rival Gaming, but actually, the games features include fewer players, meaning the jackpots could be easier to obtain at the casino. In the history of their jackpot collection, Rival has managed to pay out some impressive winnings to players from around the world. There are 5 jackpot games to choose from, including Jackpot 5x Wins, Money Magic, Major Moolah, Strike Gold, and Once Million Reels BC. All of these slots features impressive winning values, such as the 25 Feb 2013 win on Money Magic that paid just below $300,000 to one lucky player. Jackpot 5x Wins has also reached high amounts, including a win on 28 Aug 2016, which granted a successful player with over $250,000. The casino has managed to keep their record clean over the years, and members seem to have been pleased with the service they receive. In fact, the casino is so committed to providing a professional game experience that they respond to each complaint on well-known sites. However, other than misunderstandings, we couldn't find anything worth mentioning or a serious complaint that the casino has not resolved. Managed by DeckMedia the casino is famed for its remarkable promotions, a huge variety of incredibly generous bonus offers and favored by international players for never-ending bonus fun. Gaming is accessible via instant play; free download and mobile and member benefits include the stringiest security, easy, uncomplicated banking, phenomenal assistance and an easy to understand gaming layout and other services. Slots Capital Casino is licensed through Curacao eGaming and is powered by Rival Gaming since its launch in 2012. A fan favorite for Ontario players, this casino, brings entertainment to the spotlight thought is promotions and gaming library. When I first joined Slots Capital a few years ago, I was rather skeptical as it was a new casino and at that time new casinos seemed to be everywhere. However, the longer I remained with the casino, the more I found I enjoyed the features, bonuses, and gaming selection they provide. As a player, I enjoy a broad range of gaming, including slots, table games, and others. This was also a concern as the casinos game selection seemed rather limited, but I was more than satisfied with those available and didn't feel the need join another casino to find my favourite games. I am also impressed with the range of features they include with banking and support. In fact, Slots Capital Casino accepts several currencies, and both deposits and withdrawals can be made via trusted methods such as Visa, MasterCard, ECO, Neteller, Skrill and American Express. While the site features easy to navigate options the friendly support team is happy to assist members 24/7 with any questions or helpful advice and other communication options, include toll-free telephone assistance, email, and an informative online FAQ. 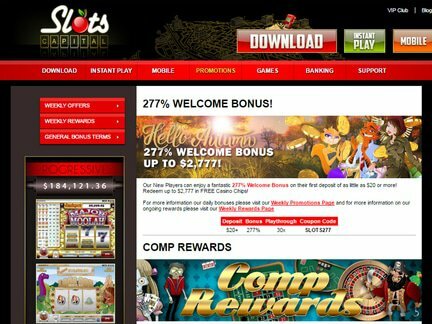 Slots Capital is a trustworthy online casino for international players and a refreshing option for those in the US. Its gaming library is geared towards slot enthusiasts and especially more so for American players due to Rival being one of the few that allows American players access. The promotions options are enticing and are geared to ensure you always have something to look forward to promotionally when logging into your account.